Netanyahu declares in Knesset that he rescinded orders to build 24K housing units in Judea, Samaria to appease int'l community over Iran. Prime Minister Binyamin Netanyahu addressed his decision to scrap plans to build over 24,000 Jewish homes in Judea and Samaria in a Knesset hearing Wednesday, explaining that the move was not to cause "an unnecessary confrontation with the international community at a time when we are making an effort to persuade elements in the international community to reach a better deal with Iran." The relationship between the US and Israel has soured since US Secretary of State John Kerry's controversial remarks supporting the Palestinian Authority' position last week, threatening a 'third intifada' if progress is not made towards a "Palestinian state", and declaring Jewish presence in Judea and Samaria as illegitimate. The relationship suffered further after the US became involved over the weekend with serious diplomatic talks with Iran, which could lead to a deal that would reduce economic sanctions. Israelis suspect that Iran will keep building their nuclear arsenal despite the deal, opening up the dangerous possibility of a nuclear Iran with international support. President Barack Obama has repeatedly linked Iran with Israel's participation in peace talks, and thus Israel's building program seems to present a threat to US-Israel relations. AFP reports that US State Department spokeswoman Jennifer Psaki said Washington was not only concerned by the initial announcement of the 24,000 homes, but also "surprised," and sought an explanation from Israel. She repeated the longstanding US position on Jewish presence in the region - which was controversially reaffirmed by US Secretary of State John Kerry last week - that "we do not accept the legitimacy of continued settlement activity." 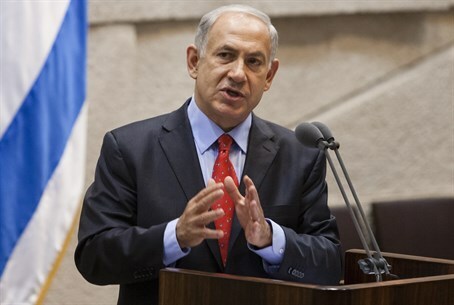 Netanyahu responded to US concerns by canceling the building program. "At this time, the attention of the international community must not be diverted from the main effort -- preventing Iran from receiving an agreement that will allow it to continue its military nuclear program." He continued, "There are not just two possibilities on the Iranian issue: A bad deal – or war. This is incorrect. There is a third possibility – and that is continuing the pressure of sanctions. I would even say that a bad deal is liable to lead to the second, undesired, result. There is no reason to submit to Iranian dictatorship; neither is there any reason to be hasty. "Iran is under very harsh economic pressure and the advantage is with those applying the pressure. It is possible to achieve a good deal to dismantle Iran's military nuclear capability. This cannot be achieved by the proposal now being discussed in Geneva. That proposal would make a gaping hole in the sanctions through which the air could escape from the pressure of the sanctions. Iran is being asked to do very little. All of its centrifuges would be left intact; not even one centrifuge would be dismantled and the underground facilities would also remain. This is not necessary because it is possible to continue the pressure," he concluded. Israel continues to lobby the US Congress to reject a deal, maintaining the threat it could pose to the region and to the world. Talks are set to resume in Geneva on November 20.